Captain America 2's Secret Villain Accidentally Revealed By Marvel? There are two kinds of movie-goers out there: there are those who like to walk into the theater knowing as little as possible, and there are those who want to know every single little detail before they've even had the chance to buy their ticket. While I personally don't think I will ever be able to fully understand the mindset that leads to the latter, members of that group are perhaps about to have a field day with Marvel Studios' upcoming blockbuster Captain America: The Winter Soldier. POTENTIAL SPOILER WARNING: While nothing has been 100% confirmed yet, there is a strong possibility that the rest of this article contains some pretty big, important details about Captain America: The Winter Soldier. 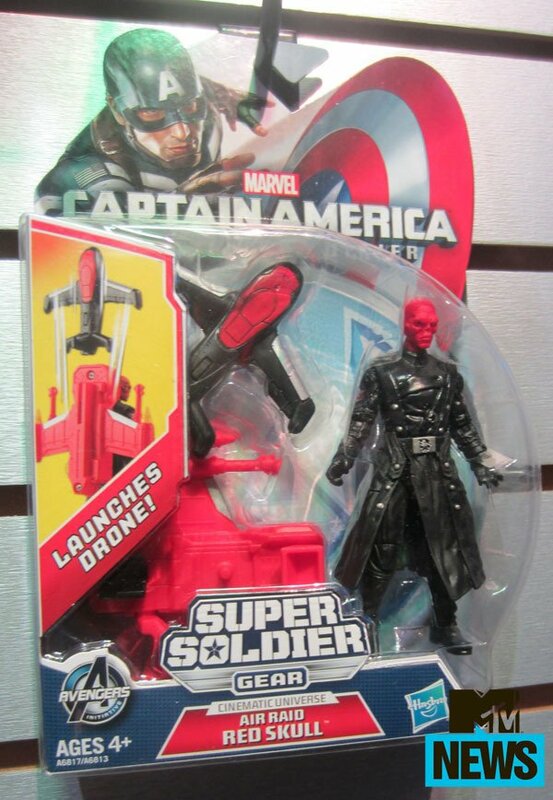 Is this a reveal that Hugo Weaving's Red Skull will be returning from where ever the Tesseract sent him in the end of Captain America: The First Avenger? My first instinct is to say no. When designing these action figure lines, toy companies want to be able to create as many products as available... even if it means creating toys for characters who are either completely absent from the movie itself. Remember the story involving a toy for Tony Stark's "Deep Space Suit" in Iron Man 3 which created rumors that the film would feature the Guardians of the Galaxy? That turned out to be bogus too. While I'm hesitant to believe that the toy has anything to do with the movie, the spoiler posted by Screen Crave is possibly a bit more serious. While they don't mention any kind of source (which makes it questionable off the bat), the site says that there is a song on the soundtrack titled "Alexander Pierce is the Red Skull." Unfortunately, they don't have any of the other song names to back of the claim that they actually saw the listing and provide no information regarding how they got the info, so take all of this with a grain of salt. HitFix points out that there is some precedence for soundtracks spoiling movies, as a track on the Star Wars Episode I: The Phantom Menace score was titled "Qui-Gon's Funeral," but I still have my doubts. What do you think? Tell us your thoughts in the comments section below.